Do you know a princess? Are you a princess? I’ve told you before about my love of craigslist, haven’t I? I’ve been able to buy and pick up a number of projects and then turn around and after applying my own brand of style and talents have been able to pass those along to others. 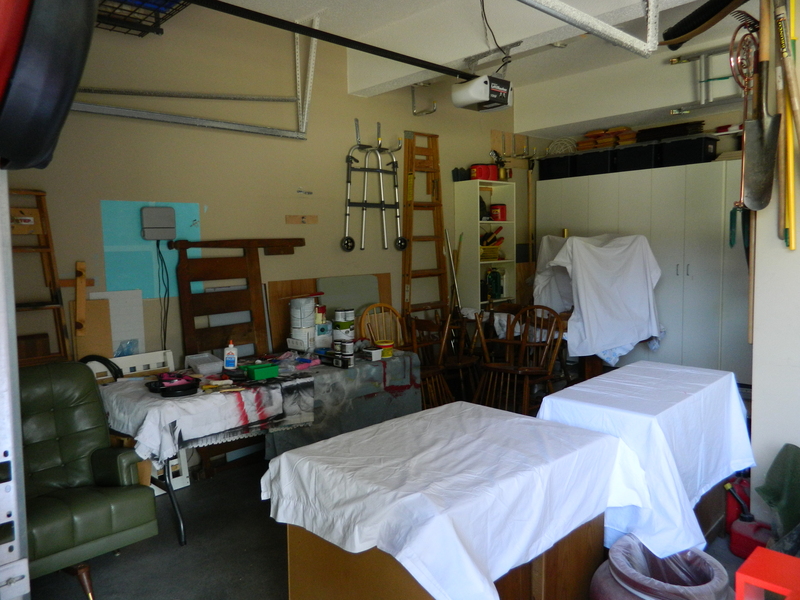 Well, that and the happenstance of a city wide garage sale this past weekend, resulted in an abundance of project turnaround. And the influx of a little cash (never hurts!). I’m really getting good with the ombre style with dressers. And they seem to just to appeal to almost everyone, boys and girls. I’ve done blue and purple and pink and this weekend I’ve completed both another pink and blue. 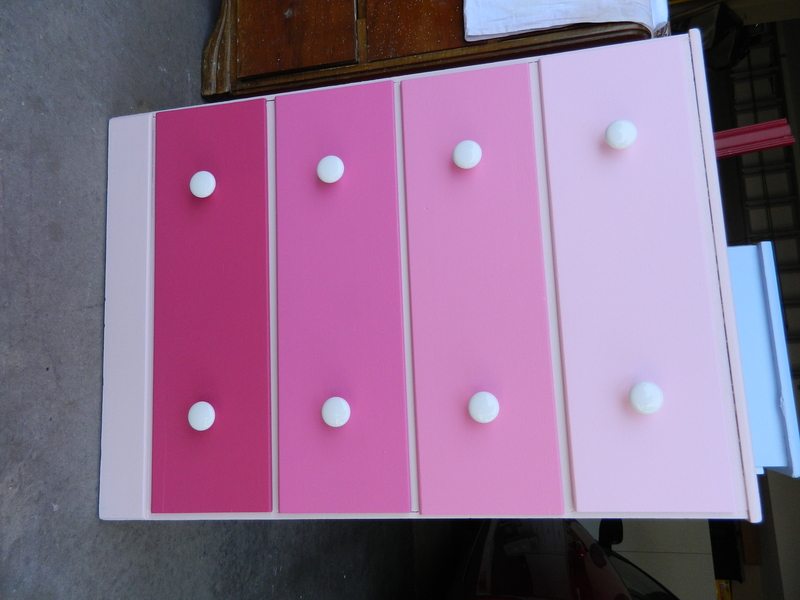 The pink was done, really, to take advantage of the pink paint that I stumbled upon at Lowe’s. What is called “oops paint”. A quart of very light pink paint, one I would call ‘blush’ that was marked for $2.50 (full price was almost $15.00!). Never one to pass up a bargain, and of course knowing that pink is a favorite of mine and would make a great color for many projects to come. 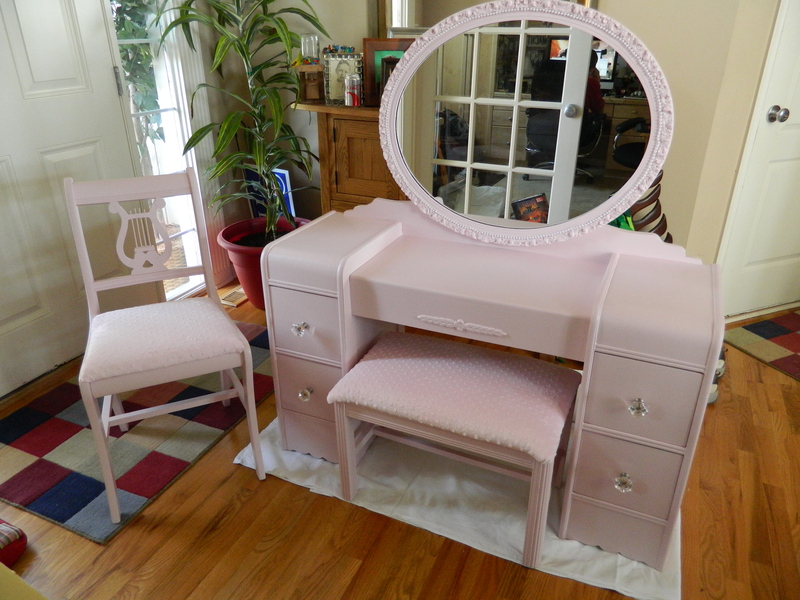 There was nothing to help reference the size in the photograph, but it didn’t take long once we were there to pick it up to realize it was a child’s vanity. It’s pretty small. But it was cute as heck and was so cheap that I couldn’t pass it up. So it went home with us. I darn near tore it down to nothing in trying to restore it, but it was for the best. It think that it had been held together with bubble gum and a strong wish! I thought if I replace the bridge with something a little wider and sturdier and maybe placed feet on it, I would be able to still use it, but it still proved to be too small for my needs. So a wider, stronger bridge was added, with a nice gentle curve on the back. I added the flower motif on the front, just seems to add a feminine touch. I had picked up a pretty beaten up mirror at an estate sale weeks ago that I knew would come in handy for just such a project. So it was added with a little brace to the top. And what vanity is complete without a mirror? 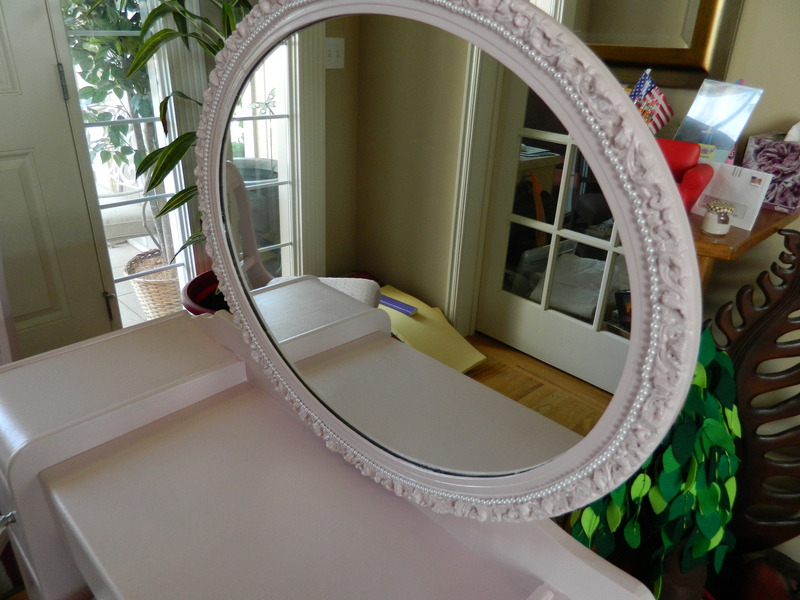 After a couple of coats of the pale pink paint, I added a single strand of “pearls” to the inside… I thought it added just the perfect extra touch of femininity to the mirror. 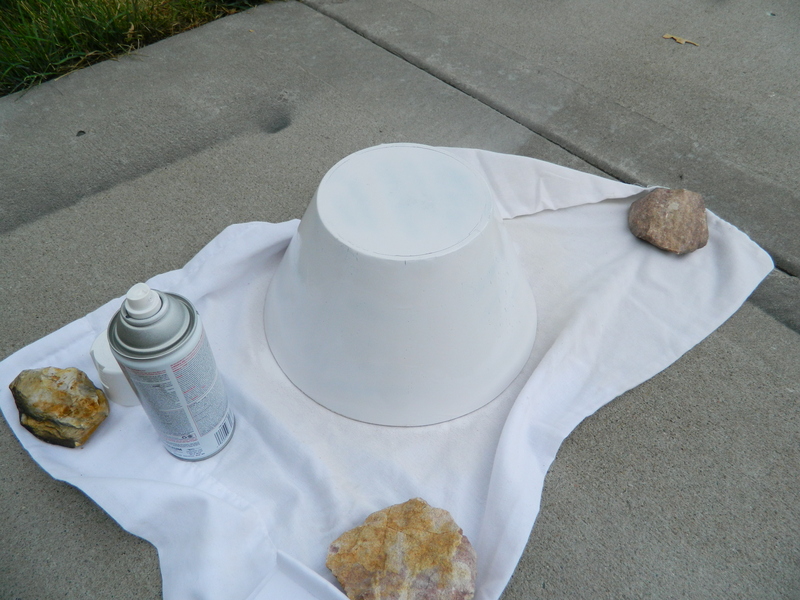 I am still considering a top coat of sparkles to the rosette edging, but I want to be careful about taking it too far. 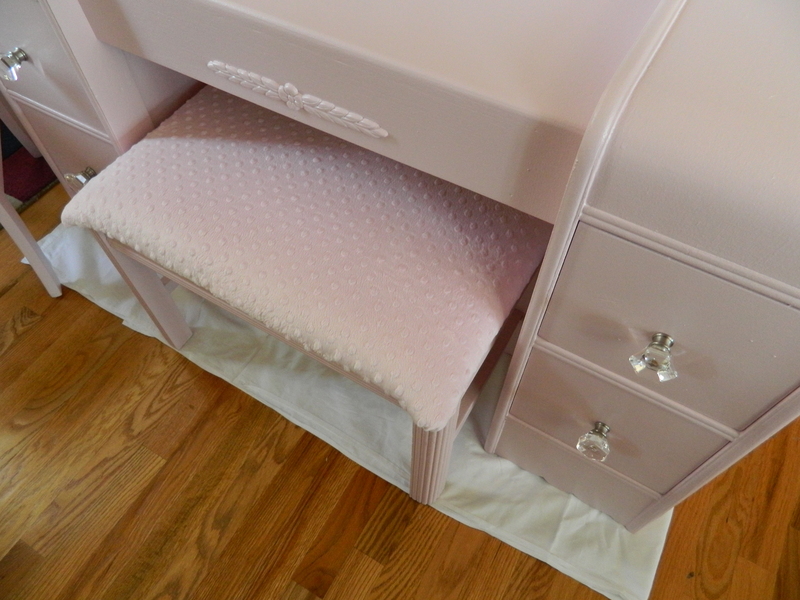 Everything got several coats of the pale ‘blush pink’ following a coat of primer. I know that you should use a grey primer for red, so I figured it would be good under pink as well. And considering that I had the majority of a gallon leftover from the red wall in my bathroom, that helped keep costs down. The wood used for the bridge and for the back support was wood that came from play kitchen project and a leaf from one of the two tables that I recently acquired for another project. 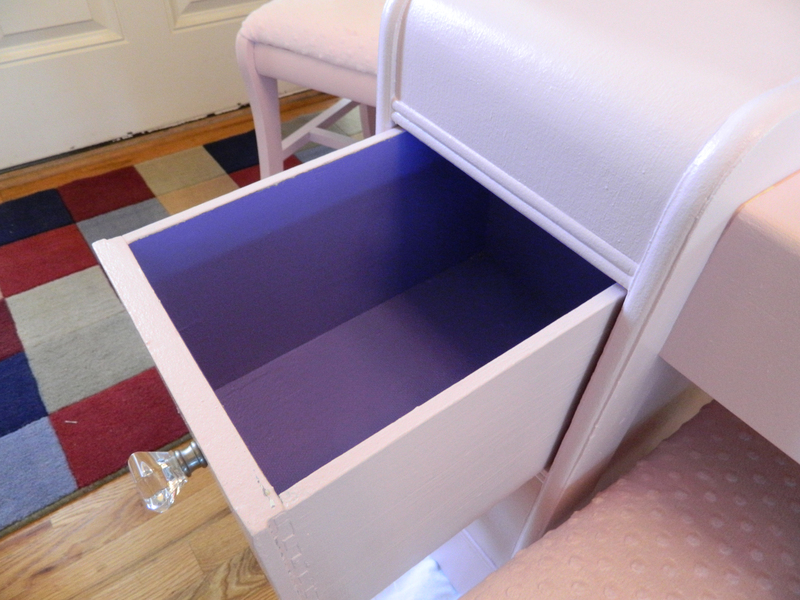 The drawer interiors were painted a bold purple (because little girls who love pink usually love purple too!) and the wooded knobs were replaced with a single clear glass knob. 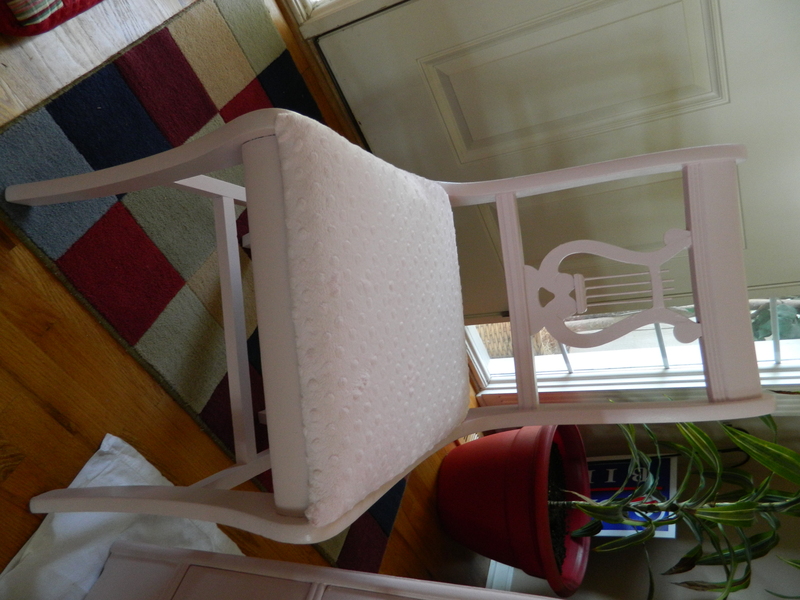 I painted both a small chair and a bench (both free via craigslist) as I wasn’t sure which one would be most suited. I found the most lovely and the ultra-soft fleece (called ‘bubble fleece’) in almost the same pale pink and upholstered both. I think I prefer the bench, but will offer the option of either (or both!). Here is a close-up of the bench… the proportions turned out perfect! Love the musical motif on the chair. I may still add some detailing here, something to add sparkle or attention to the unique styling of the seat. And there it is! Isn’t it just perfect for some little princess? I can’t wait to see the look on some little girl’s face when she realizes that this will be in her room! The primer, wood, bench, chair, glue and all the tools I already had and the Kid (my wonderful and strong and helpful son) makes all of it a real pleasure and joy to be able to create this kind of magic! I have it set up in my entryway and have taken photos of it there. I will be able to enjoy seeing it there for the next few days. I love when a plan comes together! Well, I hope you liked the work I did. And I hope I inspired you to create. Recycle. Upcycle. Whatever you do, love it! 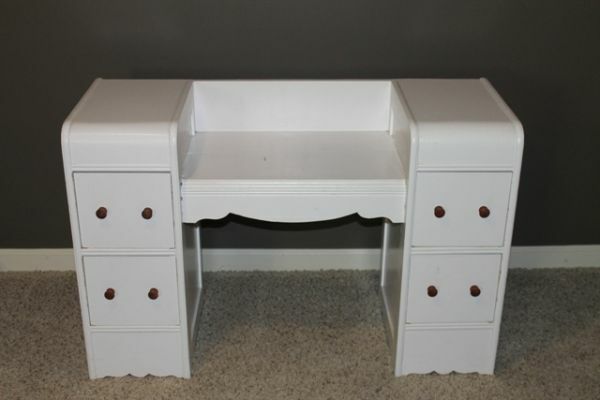 Upcycling seems to be the buzzword these days in the crafting world. Everywhere you go, people are looking to keep outdated technology, furniture and household goods out of the landfills. Its an awesome idea… go peruse pinterest.com and see what is out there. People have incredible imaginations. As many of you know, I am a mother to a single child, a son. And he is long past being a child, being a senior in high school. So generally speaking, his toys are of the technological kind. (Translation: expen$ive). But since I love the technology as well, we both indulge. But, I have a couple of very favorite girls who come to visit me periodically, my grand-nieces (my oldest brother Joel’s granddaughters). They are two of the most delightful girls that you will ever meet. But they are always so bored when they come as the house just isn’t setup for little girls’ play. So I set out to change that. And in the process do a little upcycling. 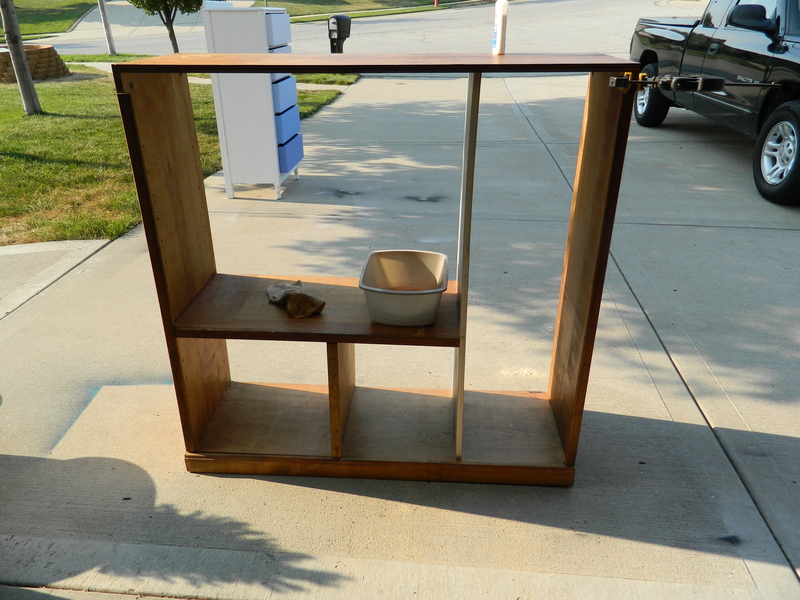 A lesson I learned recently is that you have to start with a quality piece of furniture. That doesn’t mean it has to be beautiful or perfect, but it has to have good “bones” or what you do will be for naught. 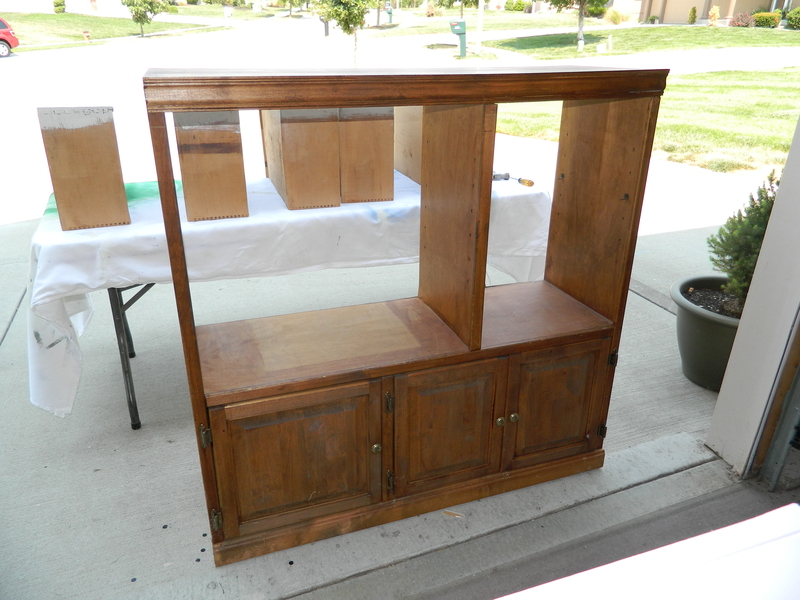 So, found an all wood entertainment center on craigslist.org for free, me and the Kid just had to pick it up. And we realized once we got it home that it came with several unwanted house guests – spiders – when unloading it. Eeek! So first up is doing a good thorough cleaning. Next up, I took off the back support, and all the doors. I removed the lower support and shelf. I then cut a board (leftover from another project) to divide the space into the “refrigerator”. It’s great to have all the tools – saws and sanders – and the help of the Kid. Put it all back together. With the remainder of the 4′ x 4′ sheet of plywood, I cut the frig door. Then everything got a couple of coats of primer. The lower section was destined to become the “oven” so I used some black texture spray paint for the inside. Then I cut the hole for the “sink”. 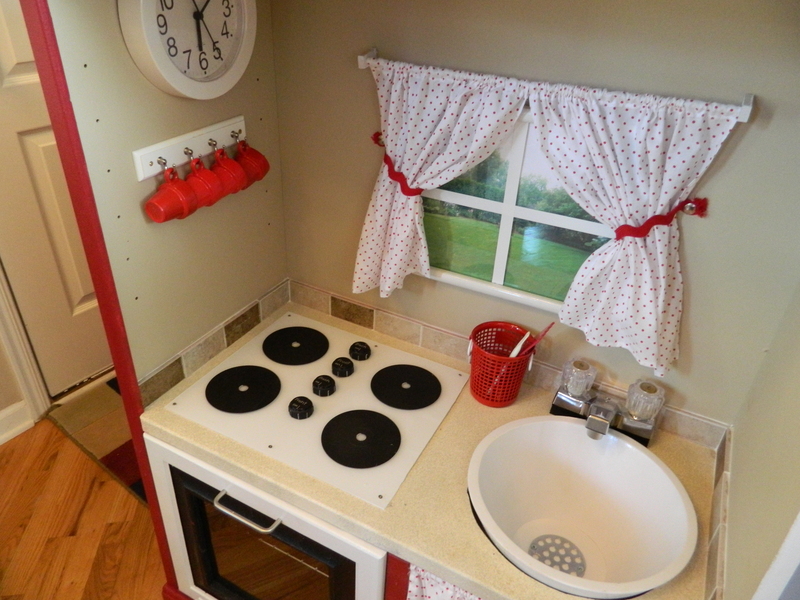 I had seen many of the play kitchens use a stainless steel bowl or even pet dish with a lip for the sink, but I couldn’t find one that was the right size. On one of our many trips through the thrift stores, I ran across a wood salad bowl that I thought would work perfectly. 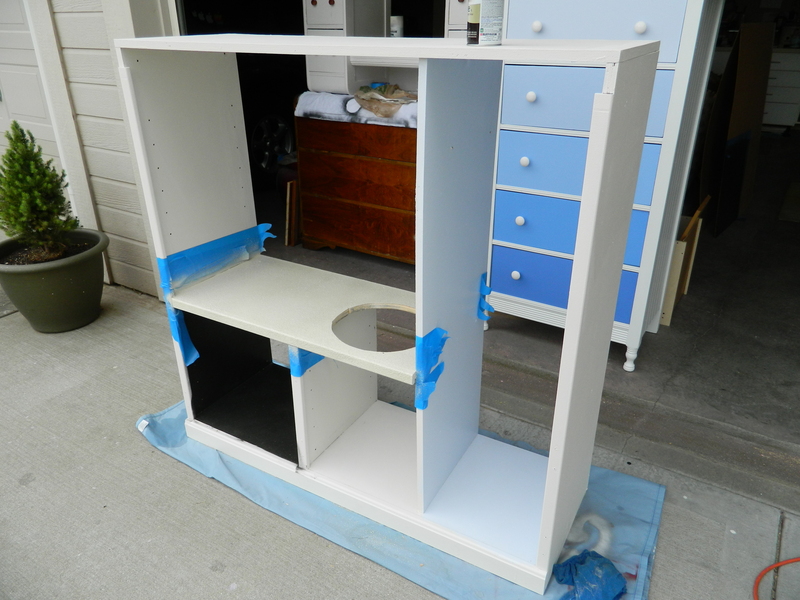 All it required was a coat of ‘appliance white’ spray paint. I found little wire shelves and an stainless steel shelf at the local Salvation Army. 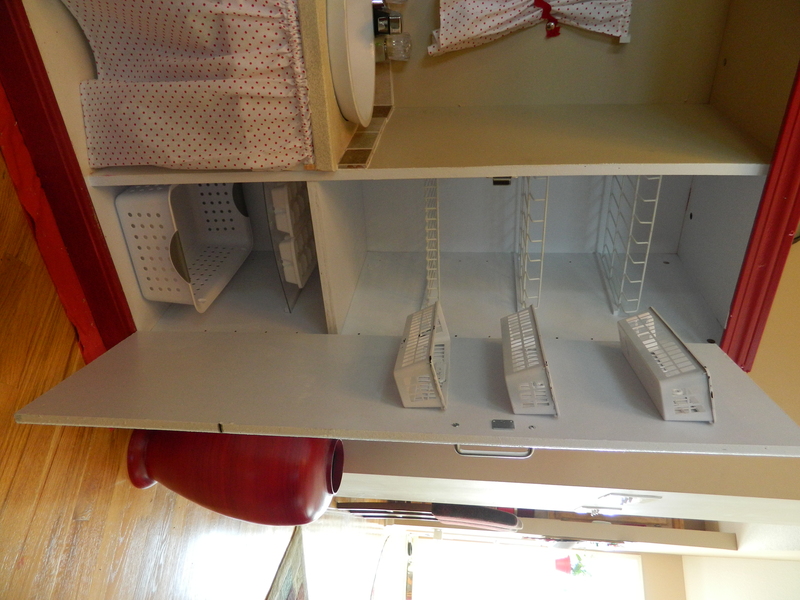 With some handy work, they became the frig shelves and the oven shelf. I then cut out the center of the oven door, painted it white and black and mounted a piece of plexiglass on the back. Magnetic closures for both the oven and the frig to keep them secure. Frig door got several coats of appliance white paint on the outside and then some fancy painting to create the logo and the “freezer door”. Inside received a couple of coats of light blue paint (makes it appear cold), little baskets on the inside of the door, handles and a piano hinge to connect. A shelf inside separates the refrigerator section from the freezer and I added a couple of ice trays and a little white basket for the freezer “drawer”. More details included a sheet of plexiglass painted white underneath to keep scratches at a minimum. The knobs are hardware found at the Habitat Store and painted black and glued onto the surface. The burners are CDs spray painted black. A little cup holder mounted on the wall holds adorable red cups. And to round it out a white working clock. The back of the unit was scrap eighth inch paneling removed from a nearby office building. 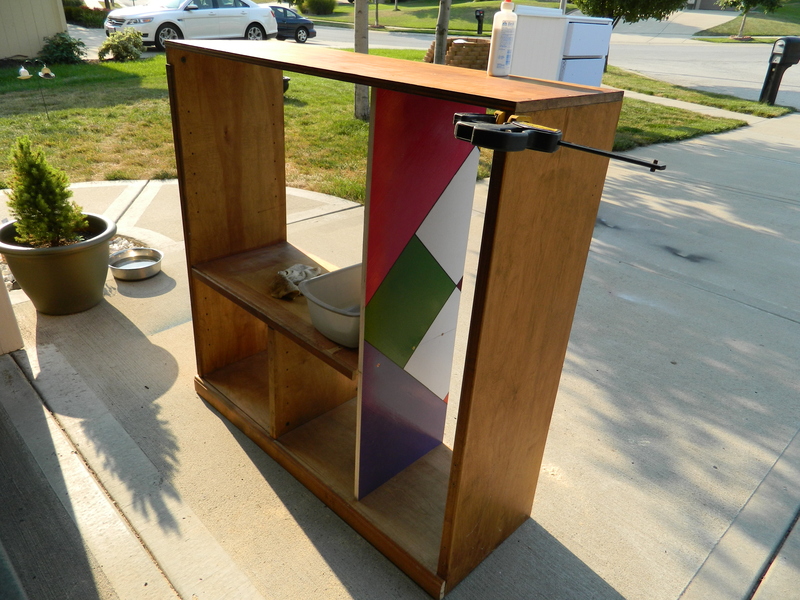 I rescued several pieces from a dumpster.It was primed and then painted to match the unit. It gives the whole thing a solid feeling without too much weight. The counter was made using a stone look textured paint and then protected with a couple of coats of clear lacquer (for a little protection against nicks and scratches). I then “installed” the faucets. These is a real working unit that I purchased from Wal*Mart for less than $10. It was by far the easiest solution, although it was the most pricey item in the whole project. 😦 dropped in the sink (which had a little ‘drain’ installed for added realism), attached the top of the stove and glued on all the knobs. I then set actual tiles around the perimeter of the counter for a back splash. To set the tile, I did use a tile mastic, but didn’t grout. I just used a little more than necessary of the mastic and it squeezed through to fill in the gaps nicely. And since no water will actually be used near the tiles, I didn’t bother to seal it either. I have to tell you about the tile adventure… it is one such story about how wonderful people can be. If you look closely, you can see that most – the majority – of the tiles are full tiles. I found these at Home Depot in the clearance, just three 12 x 12 sheets left for $1.99 each. I separated the tiles from the sheet and lined them around the perimeter of the countertop. Only three needed to be cut, one on each wall. I do a lot of tile work, but don’t actually own a tile saw (always rent), so I was in a quandary about what to do. I added a “window” above the sink which is just a framed print attached with velcro so that the picture can be changed out easily to match the seasons. A little set of curtains framing the window and a matching curtain to hide the storage area under the sink. So there you have it. I have been collecting a few odds and ends when I see them to add to the kitchen for play, I found the cutest little ‘copper bottom’ pan, some bake ware and a couple of cooking utensils. I will be making felt food over the next couple of weeks before my grandnieces next visit, so I can surprise them. I will add some photos of them playing with it at that time! Then will have to figure out a way to get it home with them, as I know that they will fall in love with it! I quite enjoyed making this and recycling a piece of furniture destined for the dump. I think it turned out pretty good, what do you think? Quick Update: Blue makes a second bow! 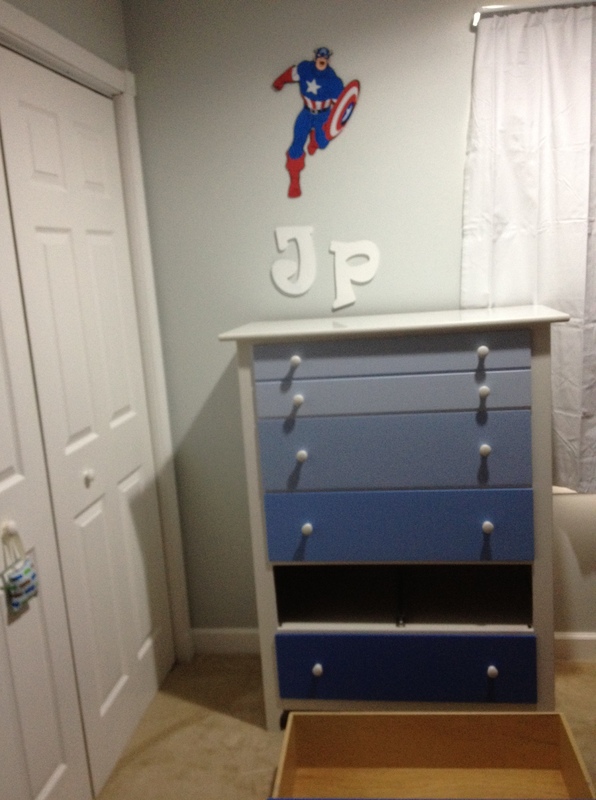 The blue ombre dresser was listed on craigslist.org for about a week when I got a flood of emails and queries. Two very serious offers, actually came down to who would get there first! 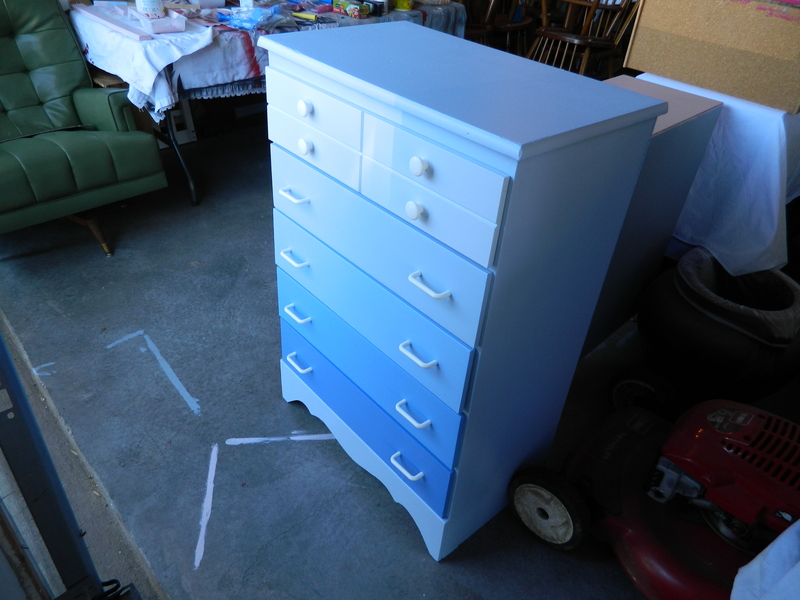 So, I had a second dresser that had been being used in my guest room that was ready to go for an ombre treatment, so it became a second blue dresser. I would love to do more, and Maria indicated that she was interested in seeing more, so I will have to look around and see what else could be done. I actually have in the back of my mind a matching baby quilt… simple yet colorful and bright. But it’s been a while since I’ve had the sewing machine out for quilt making. 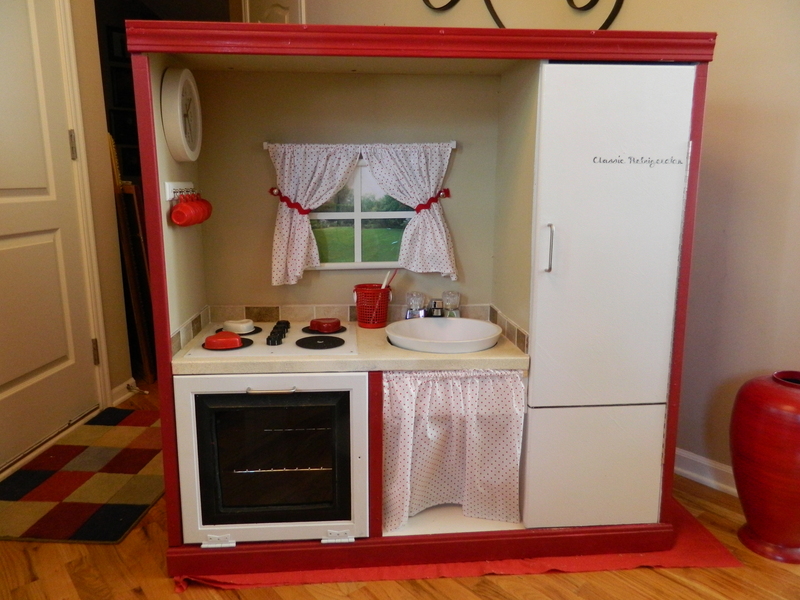 I have been busy completing the play kitchen and should be posting about it this week. Keep your fingers crossed. I am down to the final details, just finished the curtains for the “window” this afternoon. I’ve been working on this for a while and I tell you, as much as I have loved working on this, I am ready to be done with it. Sometimes when things get drawn out or I run into challenges, I lose my excitement for a project. This one is nearing that point. I’ve been guilty of starting another project as well. Usually I don’t like to start new projects when I have others unfinished, but like I said, some components were just a matter of waiting or acquiring (had to wait for something to arrive via mail) so I started in on the next project. It has become a bit bigger than originally intended, but that’s okay. Okay, off to finish the day!